"A doctor in America is killing his patients" is all what I remember from watching the news on Jordan TV sometime in the early 1990s. It was a horror story. The doctor's name was Dr. Kevorkian but he was called Dr. Death. As I finished medical school and moved to the US for training, I had an attending physician (supervisor) who liked to joke with his patients introducing himself to them with, "Hello, my name is Dr. Kevorkian, I will be your doctor" just to get a good laugh. Needless to say, Kevorkian has become synonym with death. Death has become part of my daily life since I decided to become a doctor. I remember my first patient who died, the first corpse I saw in anatomy class, the first freshly-dead body dissected in the forensic medicine course. It wasn't scary at all even for the most fainted-hearted among us in medical school. We all knew that one day we will become cold dead bodies. I always said I'd rather sleep in the morgue among dozens of dead people than sleep alone in my room with a mosquito above my head. Death is a peaceful end to an often less peaceful life. I can deal with it. But dying is torture, and very few know how to deal with it. There is a group of patients who don't die once; they experience dying, or in other words, they die every day. Those are the chronically ill patients, and every doctor has seen a few hundreds of them. I almost see one every single day. I know most of their names, where they live, if they have a car or not, even what their kids do for a living. Even in my mind I can recall the surgeries and medications that each one had and even remember their lab tests from many months back. These guys spend more time seeing doctors and doing tests than in their house. Their daily struggle is to remain alive. Their quality of life however is awful, but stable. Awfully stable. It's not going to improve and all what doctors do is slow their death, or prolong it, depending on the way you look at it. For some of these guys, Dr. Kevorkian was the answer. They asked for him. He didn't contact these patients, but they contacted him. It's illegal for you to kill yourself in most countries in the world, including the US. These patients asked Kevorkian to do it for them in a painless and quick way. Kevorkian assessed them and selectively helped them end their lives. He videotaped every patient to make sure they voluntarily requested the death. He wasn't paid for any of these procedures. Kevorkian had to stand trial for many of these murders as they've been illegal. The families of the patients stood and defended him and the decision that their loved ones had made. Kevorkian was acquitted all the time until a prosecutor played a legal trick and was able to find Kevorkian guilty of murder. He spent 8 years in jail. One thing I learned, is that people change their minds when they get sick. How many times have you heard one say, "If I get cancer, I don't want to get chemo, just let me die in peace" ? Let me tell you something: don't believe them. If they get cancer, they'll get chemo, and radiation, and surgery, and a lot of pills, and herbs, and experimental treatments, and prayers and creams and lotions and Chinese remedies and whatever your grandmother used to treat food poisoning. They'll use it all to stay alive. Some survive, some do not, and some decide to give up even before their time is over. Likewise, I don't know how will these people react when that moment arrives; the moment when they surrender, when they declare that they've had enough. We don't know how some of the people closest to us will react in these situations. I don't even know how I myself will react when this moment comes. But I know that everyone deserves to have all options available to them, and one of these options is euthanasia, or physician-assisted suicide. It's horrifying for some to think about it, and for those very uncomfortable with it (and I'm one of them) I say , don't do it. Just don't prevent others mentally-stable adults from considering it. 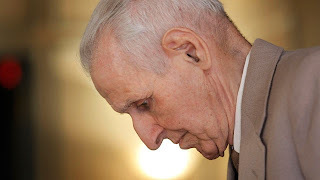 Most, if not all, of those 130 people that Kevorkian ended their lives did not want to die had they been healthy or even ill but with a reasonable quality of life. But when they got very ill, and they changed their mind. There are many things that Dr. Kevorkian could have done differently. He didn't obtain a psychiatric consultation on all patients. He didn't fully assess the medical condition of each one. It's argued that some of his patients may even had reversible medical illnesses. However, the conditions in which he worked have been very imperfect, and he himself acknowledged that. He opened a debate on a topic that is very hard to talk about and is very controversial in its own. Just like people have different perspectives of what life means, they differ on the way they think it should end. But I hope we'll agree that every one must have a complete control on his own life. We do end lives of criminals convicted of serious crimes. We do end lives of enemy soldiers in wars and sometimes even celebrate it. However we are not honoring the wish of a suffering person from ending his/her own life even if they request to, and we decide for them to have it end in pain and emotional suffering against their will rather than peace and comfort. Dr. Kevorkian, who passed away last month, said that he was serving his patients and honoring their will. By no means was he Dr. Death, as he appreciated exactly what the value of life and what it means to be living. RIP, Dr. Kevorkian, Dr. Life. "When your conscience says law is immoral, don't follow it. If you don't have liberty and self-determination, you've got nothing, that's what this is what this country is built on. And this is the ultimate self-determination, when you determine how and when you're going to die when you're suffering. The patient's autonomy always, always should be respected, even if it is absolutely contrary to best medical advice and what the physician wants." 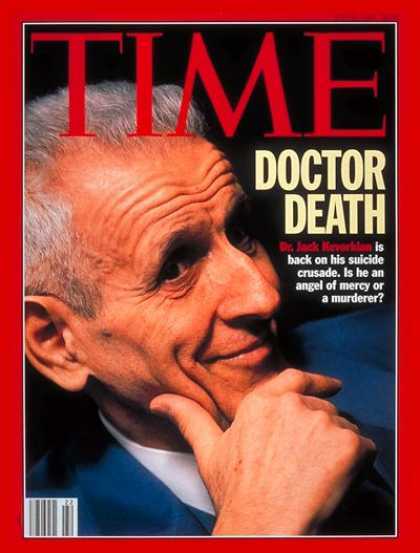 Jack Kevorkian, during his trials. Suggested Movie: You Don't Know Jack, by Al Pacino. أنـا فاهمة عليك بالزبط شو بتحكي كوني اشتغلت اربع سنين بالعناية الحثيثة ...كتير صعبه لما بتشوف ناس جد بتتعذب قدامك وحالات ميؤوس منها عم بتعيش تحت الأجهزة أشهر وهي فعليا الأجهزة هي اللي معيشتها ( بعد إرادة ربنا أكيد ) وبتشوف الأهل بيجوا ومتأملين وأحيانا ما بتقدر تحكيلهم ودعوا خلص وترحموا عليه لإنو اجتماعيا عنا غير مقبوله إنك تخبر بهادا الشي قبل ما يصير أشياء تستدعي إنك تخبرهم زي توقف القلب و الإنعاش مثلا !!! في مرضى بضلوا أشهر وحتى سنين بالمستشفى لدرجة إنو زي ما حكيت إنت بتعرف قصة العائلة وبتحفظ تسلسل مرضه ولما دخل شو كانت فحوصاته وحتى الأدوية متل ما حكيت وبتوصل عنا التمريض لما نلف راوند بنسأل صار شي جديد ؟ يلا على البعدو ....بتحزن عليهم كتير وبتشوفهم وهما بموتو بطىء قدامك بنحفوا مع الوقت الحالة بتتدهور بس ما بتقدر تعمل شي إلا إنو تستنى ربنا يهونها عليهم ...انا ضد الموت الرحيم ( وعلى ما أعتقد انت كمان ) لإنو شرعا ما بجوز. I wanted to watch the movie for quite some time but didn't get the chance to. Now, I have to watch after reading your post. I agree that he should not be called Dr. Death. Ornagee, I don't know much about the cases of merciful killing. But for one specific case that is when a dying person is surviving only via the machines then according to some Muslim scholars it is permissible to pull the plug. orangee... you gave several reasons to justify euthanasia only to say it shouldn't be allowed at the end. Of course I support it. It shouldn't be allowed to everyone who is sick, it should heavily restricted and anyone desiring it should be evaluated. Now I know that religions bans it, but it also bans a lot of other things that get practised all the time in Jordan and elsewhere , like abortions (which are done everyday in Jordan), and tube ligation (rabet mawaseer) besides a few other things. You do not have to participate in it if it's against your beliefs, but why would someone who doesn't want to live and is capable mentally of making such decision be denied that choice? Jaraad, it's done all the time in Jordan, and that's the right thing to do. Unfortunately in Jordan it's almost never the choice of the patient but his family, because the patient is unconscious and unable to make decisions for himself. In the US many people have advanced directives and express their desire to be resuscitated or not in case they end up on a machine. I've never seen any patient so far who said "even if I'm a vegetable living on a machine I still want to stay alive" but I've seen families making such decisions for patients who were unable to express their wish before they got ill. And yes watch You Don't Know Jack, it's a little bit surprising and the acting is brilliant. Over here, I've seen CPR cases drag too long for the sole purpose of calming the patient's family. Like you said, the family here controls everything. Ehab, it's not that difficult in most cases, you need to talk to the patient and see if he knows what he's talking about. We always ask patients if they want to be resuscitated if their heart stops beating for example, and we take their will and document it without even questioning if they are capable of making such decision. So why not do the same if someone asks to end his life? Brownie, why not? is it your religious belief? You said yourself that they are suffering and their life means nothing to them, and agree that their best interest is in dying, why not end their lives knowing that this is their own wish? "Their best interest is in dying" is not applicable when that person believes in God and that they will be rewarded for their patience just like they will be punished for killing themselves. I know God is Just and He (wallaho a3lam) wouldn't punish a suffering person for killing themselves the same way he would punish someone who kills themselves for other reasons, but still, it is haraam, and haraam is scarier when it's the last thing you're going to do in your life. For a person who doesn't believe in life after death then yes this may be the easy way out, but if you know that this is something you will be punished for (and therefore that "peaceful" rest you're dreaming of won't be so peaceful after all) then you know that patience is your only option. After all, as Muslims, we are required to guide those who are lost and stop them from doing something that they can go hell for, and we will be punished for just standing there doing nothing while watching someone end a life, even their own. I believe this applies to Christianity too? Thank you for the post.. I have to admit that I didn't know anything about Dr. Death or merciful killing before watching the movie almost a year ago. Back then I was disgusted of the idea and was totally against it, until I saw my grandfather suffering.. Thankfully his suffering did not last more than 2 weeks, but each day I was hoping some doctor would somehow end it.. So I do believe that in the extremely "hopeless" cases , it could actually be an act of mercy.. but if it become legalized don't you think that it will open the door for random unnecessary killings? I am not against the idea, but I do think that when considering legalizing such an act extreme measurements and precautions should be applied .. I am very convinced that the idea of merciful killing is not an issue of debate where it not for religious beliefs. The first comment on your post sums it all, someone that experiences first hand and knows by heart the suffering that exists, yet ends the comment by saying: of course I'm against it because 'god' doesn't like it. If brain and logic worked together with no interference and blockage, this planet would have been very different. Noor.Jab, sorry for your grandpa, and checking the name of your empty blog suggests you couldn't say a proper goodbye to him. I can't tell you that it won't allow for unnecessary deaths to occur. However it should be heavily restricted and closely monitored. I don't disagree with you, but believe it or not I think religious men can be much more flexible than you can imagine. If the goal of religion is to honor human life and respect its dignity, I suspect that euthanaisa in their perspective won't, at least, be considered equivalent to murder or suicide.